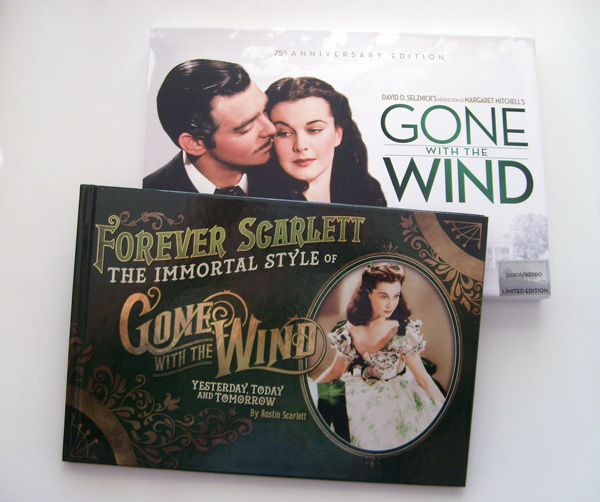 Warner Bros' lavish box set Gone with the Wind: 75th Anniversary Edition has arrived as another excuse to revisit Scarlett O'Hara and her myopic world of "war, war, war." Interestingly, the 75 years that have elapsed since the film came out mark the same timespan that passed between the movie's original release and the Civil War. As people watching Gone with the Wind today on their widescreen TVs can view it as an glossed-up version of the way Hollywood was in 1939, so did audiences back then flock to theaters to escape grim reality for a stylized, hyper-melodramatic version of one of American history's sorriest episodes. Gone with the Wind is a rich, lengthy yet captivating fever dream of a movie, the singular vision of driven producer David O. Selznick (Dinner at Eight, Rebecca). Selznick's mission was to faithfully transfer Margaret Mitchell's wildly popular novel onto film, using all the resources his (and MGM's) money could buy. It could have been a sprawling, revisionist bore, yet the story is told with a remarkable clarity by focusing on a single, memorable character - selfish Southern belle Scarlett O'Hara, who is fantastically brought to life by Vivien Leigh. Leigh pretty much grabs onto this character and never lets go, giving Scarlett an admirable perseverance which never gets showy or mannered. Essentially a four-hour way of saying "you can never go home again," Gone with the Wind chronicles Scarlett's feisty spirit before, during and after the Confederates' defeat. In the beginning, Scarlett is a pampered young lady at Tara, the Georgia plantation owned by her Irish-American father, Gerald O'Hara (Thomas Mitchell). Although she's wooed by all the local men, Scarlett is obsessed with Ashley Wilkes (Leslie Howard) despite stern warnings from her maid, Mammy (Hattie McDaniel), that it's a futile pursuit. Although he's also attracted to Scarlett, Ashley is devoted to his sweet, docile cousin, Melanie Hamilton (Olivia de Haviland) and resolute in eventually marrying her. During a party at the Wilkes estate, Twelve Oaks, announcing Ashley and Melanie's engagement, Scarlett meets an intriguing man named Rhett Butler (Clark Gable). The charming rogue from Charlotte makes a play for Scarlett, although she ends up accepting a proposal from Melanie's wimpy brother, Charles (Rand Brooks). She soon becomes a widow as war is declared and nearby Atlanta is in a state of panic. Rhett makes another play for Scarlett at a benefit dance for the Confederate army, who are badly massacred after Union troops invade Georgia. While Ashley is off fighting, Scarlett shelters Melanie at Tara and becomes a reluctant midwife when her baby arrives. Needing to escape the Yankees' onslaught, Scarlett approaches Rhett to help her escape the inferno of Atlanta with her nervous maid Prissy (Butterfly McQueen), Melanie and her newborn child. Halfway back to Tara, Rhett leaves Scarlett and the others to navigate the journey alone - yet, this isn't the last we see of him. Having not experienced GWTW since about its 50th anniversary (1989, do the math), I'd have to say that it's improved markedly since that initial viewing. Back then, the movie seemed by turns enthralling and dull. I remember marveling at the technical aspects of the production while bemoaning its pompous touches (why is there music behind every single scene?) and the odd casting of reedy Leslie Howard as a 19th century chick magnet. This time was a much more engrossing experience, although my attention wavered during an entire, previously forgotten half-hour stretch - between the film's intermission and when Ashley arrives at the battle-scarred Tara to reunite with Melanie and Scarlett. Mostly that section reenforced the fact that Scarlett was a person who would manipulate anyone, at any cost, to get Tara back to pre-war plushness. If GWTW still appears as if slap-dashedly revised at every step of the filmmaking process (confirmed in the making-of doc in the set), its immersive power actually hasn't dimmed all that much over time. The intricacies of the book were streamlined and made more cinematic by screenwriter Sydney Howard and several others. Performance-wise, Leigh's intense portrayal of Scarlett stands out most vividly, although all four of the lead actors are perfectly cast. Several other supporting players also did memorable work, including McDaniel and Ona Munson as Atlanta madame and Rhett's old friend, Belle Watling. Even if it weren't for the script and acting, one could watch GWTW strictly for the then state-of-the-art use of photography tricks, matte paintings, and lavish production design (by William Cameron Menzies). For such a mammoth, highly scrutinized film, GWTW takes a lot of chances. This is particularly true with the cinematography and the use of lighting, darkness and composition - the scene with Melanie about to give birth, figures silhouetted by orange light behind bedroom shutters, is still a stunner. Gone with the Wind has also had its share of controversy, particularly in the way it depicts slaves as contented, one-dimensional creatures. Characters like McDaniel's indomitable Mammy may rightfully be viewed as damaging stereotypes, but I didn't see too much offensiveness in the way the movie treats Mammy and the other African American characters. Tara's plantation workers are shown as members of their extended family, and Scarlett treats them as equals (even the flighty, childish Prissy). As for the stereotypes? There's just as many stereotypical white characters. Gone with the Wind, the book and the movie, was never meant to be a straightforward history lesson. 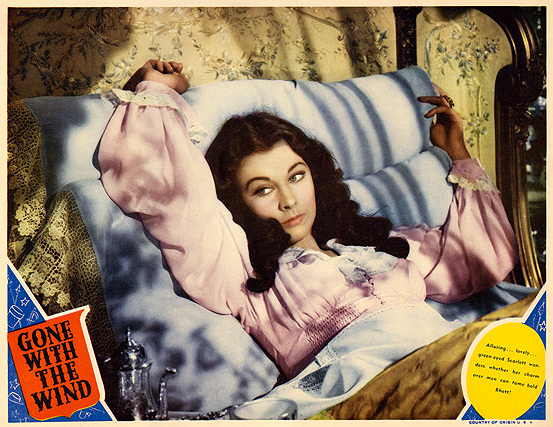 Crucially, this tale is entirely seen through the biased eyes of Scarlett O'Hara (Leigh appears in just about every scene). It's an epic-sized yearning for an idealized South that not only will never return, it never existed in the first place. 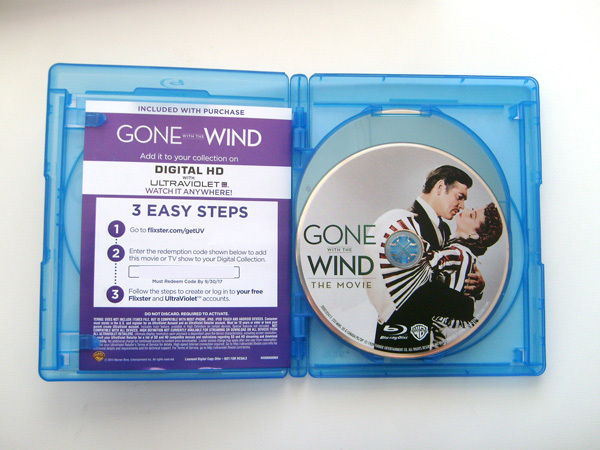 Gone with the Wind: 75th Anniversary Edition comes in a limited edition, numbered 11.5x8 inch box containing the film and its supplements on three Blu Ray discs and one DVD housed in a standard-sized hinged Blu case. A 34-page hardcover book, Forever Scarlett: The Immortal Style of Gone with the Wind - Yesterday, Today and Tomorrow, has scores of photos of the costume designs alongside surprisingly astute commentary by Project Runway contestant Austin Scarlett. 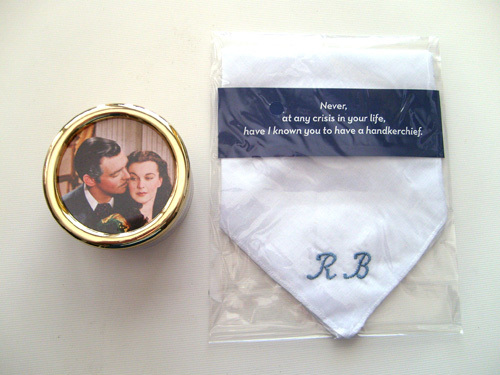 The package also includes a music box with Gable and Leigh's photo on top - turn the key, and it plays "Tara's Theme" - and a replica white handkerchief monogrammed with Rhett Butler's initials (similar to the hankie Belle Watling gives Melanie in the film). If this package seems excessive to all but the most serious GWTW obsessives, you might be happy to know that Warners is also putting out less bulky editions of the film as retail exclusives. Target offers a Diamond Luxe edition with only the movie and new supplements in a slim digipack, while a similar two-disc standard-sized edition is also available as a Wal-Mart exclusive. For this 75th Anniversary Edition of Gone with the Wind, Warner has supplied a nice, extraordinarily clean restored 1.37:1 image. The film is a high-definition upgrade of the comprehensive 8K digital restoration of the film made in 2004, and it looks gorgeous. It preserves the inherent texture of the original film stock, while scrubbing away dust and dots for a ravishing picture full of depth and detailed surfaces. The Technicolor photography was used in a subtle way, reflected in this Blu Ray's saturated palette of browns and golds. If the restored image seems keyed towards golds and yellows (more than the '90s print), it's likely done in a way that makes it truer to the original 1939 version. Nevertheless, this crystalline version brings out a lot of details and textures I never took notice of before (Vivien Leigh's eyes!). The disc supplies audio in both the original mono and a Dolby TrueHD 5.1 mix. While the track doesn't make much use of Surround capabilities (mostly it's used for atmosphere on busy scenes, such as Scarlett navigating the fleeing of Atlanta), it's a pleasant listen with spacious, judicious sound mixing and a depth that brings out the bottom end of the original track. There were a few times when the sound was distorted and wobbly, while the limitations of 1939-era recording technology ensured that there's a subtle hiss present at all times (less noticeable on the 5.1 mix). Additional sound mixes are provided in French 5.1, Castillan Spanish 5.1, and Latin Spanish 1.0, while subtitles are included in English SDH, French and Spanish. As with the A/V presentation, most everything about this 75th Anniversary edition of GWTW has been duplicated from the 70th Anniversary release from 2009. For the film itself, that includes the authoritative Audio Commentary by film historian Rudy Behlmer included on Disc One. The only new extras are about 40 minutes' worth of featurettes included on Disc Three. The Making of a Legend: Gone with the Wind (123:06; 1988) goes through every step of the film's production with absorbing detail. Includes interviews with Butterfly McQueen, Ann Rutherford and Evelyn Keyes (who played Scarlett's sisters), and several secretaries, production assistants, cameramen, and an eyewitness at the film's unannounced sneak preview screening in Riverside, California. The Supporting Players (2009), 1-2 minute mini-bios of the many fascinating supporting actors in GWTW. Historic Theatrical Short The Old South (11:19), a 1940 black and white short produced by MGM to give some historic context to GWTW and the cotton farming industry. Atlanta Civil War Centennial (3:40; 2004), newsreel footage of David O. Selznick, Vivien Leigh and Olivia de Haviland returning to Atlanta in 1961. Trailers from 1939, 1961, 1967, 1968 and 1989. Moviola: The Scarlett O'Hara War (97:23; 1980), amusing and semi-satirical made-for-TV movie on the search for an actress to play Scarlett stars Tony Curtis as Selznick and Harold Gould as Louis B. Mayer. International Prologue (1:17), a text prologue giving some background on the U.S. during the Civil War, made for overseas audiences. Foreign Language Versions (2:37) clips from the French, Italian and German-dubbed editions of GWTW. Old South/New South (26:50) is a thoughtful, almost apologetic documentary which interviews several historians, authors and experts on how cultural attitudes in Atlanta and the Southern U.S. have evolved over the years. As the film tells it, Southerners live with the ongoing challenge of adapting to changing values while still retaining their own unique heritage. Although it doesn't deal directly with Gone with the Wind often enough, it's a competently produced film with some fairly interesting observations. Gone With the Wind: Hollywood Comes to Atlanta (12:38) compiles various vintage newsreel footage of the film's premiere, backed with strident music cues. Disc Four is a double-sided DVD containing MGM: When the Lion Roars, the lavish six-hour retrospective documentary produced for cable station TNT in 1992. Hosted by Patrick Stewart, this comprehensive history holds up very well and is a cool addition to this set. Note: this is a re-edited program previously released on DVD. In this version, all film clips featuring Fred Astaire from the original broadcast edited out. When it comes to constantly re-releasing the towering 1939 Civil War melodrama Gone with the Wind, the slogan for Warner Home Video's marketing department may as well be "Tomorrow is another day." While the 75th Anniversary deluxe edition isn't all that essential for those who already own it on Blu Ray, for everybody else it's a fantastic showcase for this controversial yet gorgeously conceived masterpiece. If you haven't seen it in a long time, David O. Selznick's insane attention to detail and Vivien Leigh's intensity can even be revelatory. Old-style Hollywood at its best, right here. DVD Talk Collectors Series.